On a hot day last summer a group of mothers and babies clustered around one of the picnic tables in Astoria’s Studio Square beer garden. Chile was playing Spain in the World Cup. The mothers were penned in by pint-clutching Chile fans riveted to the game on a big screen at one end of the garden. I was there with two-month old Jack snoozing in his stroller. I was enjoying watching the older babies playing on the table, amazed that one day he’d be like that. They were smiling and sitting. Holding things! 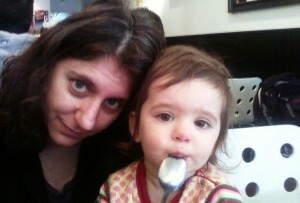 One of the other mothers was novelist Marcy Dermansky, with her then eleven-month old daughter Nina. A New York Times journalist was present too, profiling Dermansky’s latest novel Bad Marie. The novel is about a nanny, the eponymous Marie, who runs off both with the father of the baby she’s looking after and the baby herself, two-year-old Caitlin. This weekend I interviewed Marcy for this website, accompanied by our babies. Jack is now sitting, holding things and smiling a lot. Nina is almost counting to six. I asked Marcy whether she feels she would have written the Caitlin character any differently now that she has a daughter of her own (the book went to print just before Nina was born). Marcy was raised in Englewood New Jersey. She has also lived in San Francisco, New Orleans, and spent a year in the Dominican Republic (“My husband had a job for a start-up translating company there, and I had a year of working on a book and swimming.”). She moved to Astoria ten years ago. Her short story “Waiting for Big Bird” is set in Astoria (specifically in Café Bar on 34th Avenue) and is coming out in a forthcoming anthology called “Forgotten Borough – Writers come to terms with Queens.” But she says: “That’s the first time I’ve written about Queens. I think with fiction a lot of times you write about a place after you’ve left it. 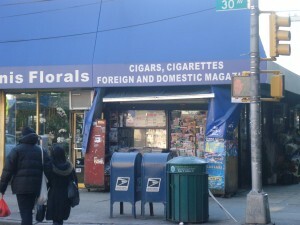 I’ll probably write more about Queens when I live somewhere else”. Dermansky does some of her writing in 30th Avenue cafés. 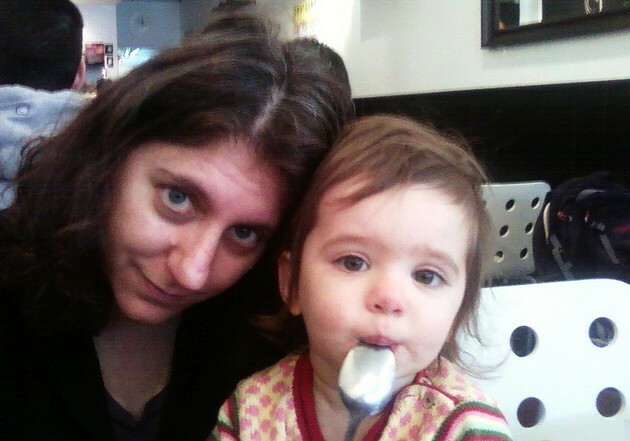 Like Harissa (“the food is always delicious”), Gian & Piero bakery by 45th Street (“it’s near an excellent playground”) and Brooklyn Bagel & Coffee (“Nina loves their chairs”). As well as writing her own fiction she edits other people’s novels and stories and writes film reviews. She used to have a daily writing schedule. Now it’s Nina who determines when she does and doesn’t write. The hardest part of writing a novel, she says, is coming up with the initial idea. 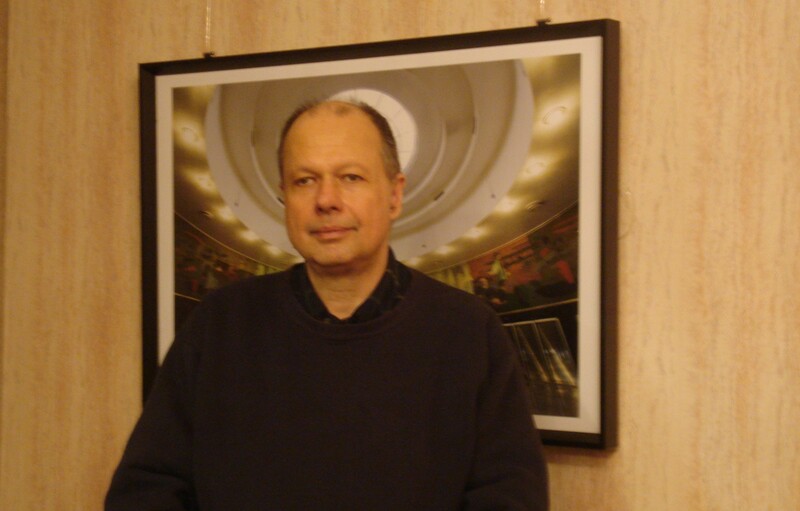 “Once you have the idea, you can just write for a couple of hundred pages. That’s what I like about writing novels, they’re long. Every day when you start working you have this book and you keep writing it. The hardest time for me as a writer is when you finish a novel. Starting a new one is very daunting. This week’s interview, on 22 January, was with someone who does not live or work on 30th Avenue but who knows a lot about it. Bob Singleton is the Executive Director of the Greater Astoria Historical Society. “We’re speaking in the offices of the Greater Astoria Historical Society on the 4th Floor of the Quinn building, in the heart of Long Island City. The society represents the neighborhoods that comprised Long Island City, one of the three cities that formed greater New York in 1898 – New York, Brooklyn and Long Island City. The goals are to use our past not to weep for what’s lost, but to help build the future. We aim to help people understand and appreciate the heritage of this wonderful neighborhood. We have some information on the actual birth of 30th Avenue. The original landowner went to Astoria Village and said he wanted to donate some land to start as a street. That was back in the 1850s. It ran from the East River all the way to 51st Street, which at that time was the border of Long Island City. At the beginning, 30th Avenue was simply some empty lots that weren’t filled. Then the trolley cars started to run along it in the 1870s and 1880s. Small buildings started to line the trolley route. They were mostly houses. 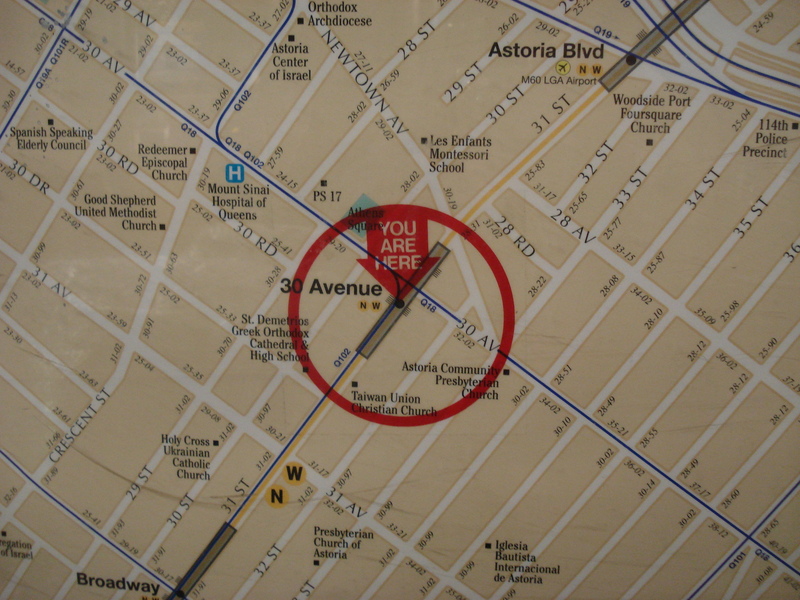 In those days the area was well spread out, and most of the shops were along the major streets such as Steinway, Astoria Boulevard or Vernon Boulevard. The shops on 30th Ave came later. 1917 was really the big boost of Grand Avenue, as it was called then, when the elevated train was put in and a station was put up on Grand Avenue. Literally overnight the area became developed into what we see today. It was lined with mostly three-story buildings, some higher. You had the shops and stores on the ground floor, and then in many cases those days the actual owners of the shops would live upstairs. In the early days there were a lot of German stores. Also many of the shop-owners were Jewish. The shop-owners living upstairs were really part of the neighborhood. They supported the softball teams and local charities. There was a wonderful relationship among 30th Avenue people that started at that time and still exists to this day. The name changed from Grand Ave to 30th Ave at some point in the 1920s. Queens adopted what is called the Philadelphia system, in which avenues run East and West, streets run North and South. It was a grid that was imposed on the whole borough of Queens. The reason being, Queens was actually an amalgam, with different townships and villages, so there were a number of different Washington Streets, Main Avenues and so on. They decided it would be better to have just one system for the whole area. Of course populations change, and retailing changes over the time. So what used to be mainly retail stores, small five and ten cent stores as they called them in those days, small grocery and clothing stores, began to evolve. Today if you walk down 30th Avenue you still see some of the original buildings. For example the original police precinct and the original Long Island City Firemen’s Association. The police precinct building is now the HANAC [Community Services Center] building. The Firemen’s Association is now a medical clinic. But as you go between the area between 31st and Steinway Street, which is considered by many people the heart of 30th Avenue, you’ll now see many outdoor cafés, and many food specialty shops. The Greek and Italian communities are well known for their fabulous food and a café society. 30th Avenue today is in as much demand today as it was when it was first laid out many years ago. It’s hard to say precisely how it will change in the next 10 years. We are seeing much more housing, and taller buildings being put up on 30th Avenue. So it will become much more densely populated, in terms of structures. You’re getting a lot of other ethnic groups too – Bangladeshi, Arabic, Albanian, Mexican, Brazilian etc. – so the area will become still more diverse than it is today. You are also seeing another interesting demographic, and that’s young urban professionals who are moving to New York City. Unlike in the mid-20th Century, there is a big movement for the best and brightest of our society from all around the world to move into urban areas. That’s even in the United States, where the suburbs were the thing in the mid 20th Century. I think people are rediscovering the benefits of living in a community like ours. If you walk down 30th Avenue you see all the things that make a neighborhood great. You see vitality, you see interesting people, you see excitement, a buzz in the community. 30th Avenue is one of the finest parts of what is a fabulous neighborhood. 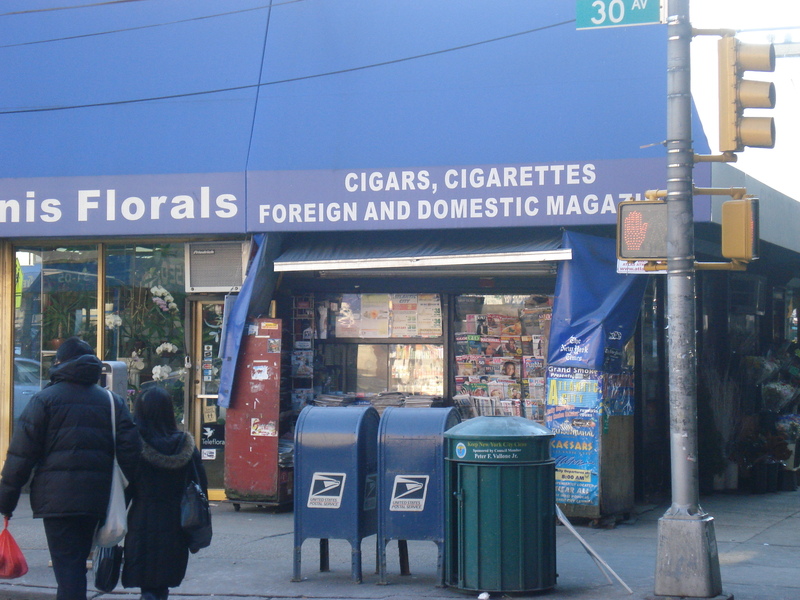 One thing we say about Long Island City and Astoria is that is has all the benefits of a great city with all the wonderful aspects of a small town. 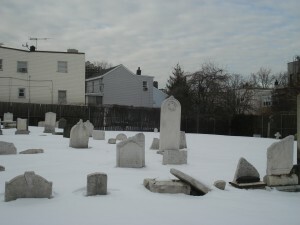 The first time I walked past the cemetery at 21st Street and 26th Avenue I didn’t pay it much attention. It looked like a random group of relatively recently-installed tombstones on a patch of grass, behind a mesh fence. The second time I noticed a sign saying “Our Lady of Mount Carmel” cemetery. I presumed that the church doesn’t have its own on-site burial ground so used this one, a few blocks away. This time the tombstones were covered in snow – a double burial. But I’m always curious about cemeteries so decided to find out a bit more about it. I learned that it’s next to the original site of the church. All of the people buried there are Irish immigrants who died between the 1840s and 1890s. They had moved to Astoria to work in the big houses of the wealthy around 14th Street, in greenhouses and in silk factories. All were Irish, that is, except one, an Italian gardener who worked in the cemetery. More about it here. The 30th Avenue sidewalks are quiet on early Sunday mornings, especially when there is snow on the ground. People who are out and about are taking life at a slower place than on the busy weekdays. 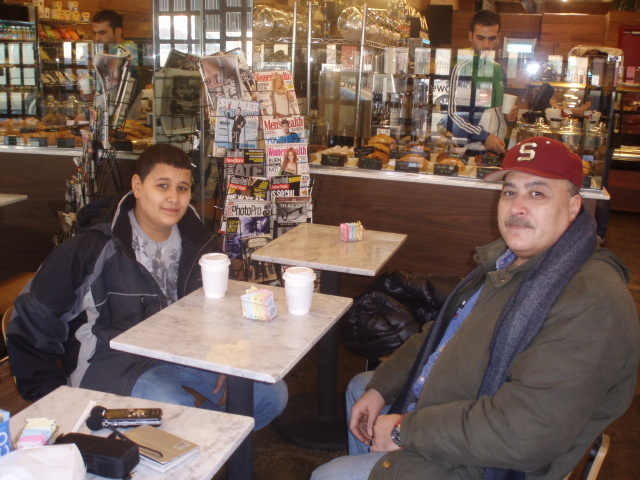 This Sunday morning I found father and son Abdel and Ahmed Farghaly in the Bakeway café near 29th Street. Abdel came to New York from Egypt 20 years ago, choosing Astoria because he had friends already here. He works in a packing warehouse, “40 hours a week now, because you know, I’m getting older!” Ahmed, now 12, was born here and goes to school nearby. On the face of it that’s such a simple phrase. But give it a moment’s thought and it breaks into thousands of possibilities. Who is “you”? And for you, what is “here”? Is it your first time here? Your six hundred and sixty-fifth? Are you pleased to be here? Every “here” has as many perspectives as people who pass it by. On the “You are here” local area map at the 30th Ave station I was surprised to see 12 places of worship within the small segment that I photographed. And the map shows not a great deal else. 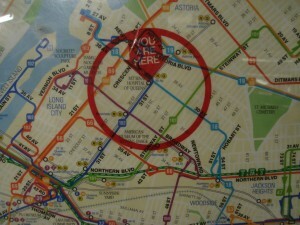 Of course if the map tried to show everyone’s destination its detail would be overwhelming. Perhaps the predominance of churches is because the MTA local area maps can only show non-commercial landmarks, so as not to promote some commercial venues over others. In this part of Astoria those happen to be churches, of which there are a lot. It has the disorientating effect of elevating the churches and erasing everything that lies in-between. Sometimes I buy a newspaper by the 30th Ave subway station to read on my way into work. It can feel a bit old-fashioned, unraveling the large paper and turning its pages while trying not to elbow my fellow-passengers, whose attention is focused on their blackberries and i-books (or sometimes on their paper books – I wonder how long that will be the case?). Ali himself is from Yemen. His father moved to the US in 1969, spending ten years in California before moving to New York. He set up a newspaper stand that became the shop. His father has now died, and Ali runs the business. He starts work at 5am, seven days a week. His mother and sisters still live in Yemen, and he often goes to visit. Regarding the Yemeni community in Astoria, he says that it is small – perhaps 20-30 people – the Yemeni population is much bigger in Brooklyn and the Bronx. “Maybe in the future I’ll start working in a restaurant,” says Ali. He’s not sure he’ll be selling newspapers for ever. 30th Ave has begun the year with a mountainous landscape. Last year signed out with a mammoth blizzard and there are still mountains of un-melted snow along the sidewalks, streaked now with dirty patches. 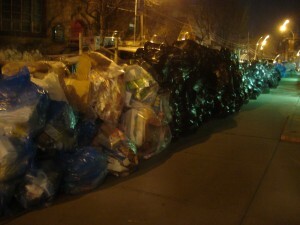 There are mountains of trash bags too. The garbage trucks were put to work clearing snow (supposedly), so haven’t been doing their usual rounds. The short lives of Christmas trees have been made a little longer, as they await collection. Some are lying down on their sides by the trash bags. Others have been stuck upright in snowmounds, temporarily re-planted.